description: "name of license owner"
You don't have superuser rights @sahanpasindu, try with sudo. BTW, thanks for the trick! @sahanpasindu Did you try with sudo? how to modify staruml .can u please explain full process.which tol to be used. For windows users you should run your terminal as Administrator. If prompted to enter password then enter password and then type dG to delete everything. Hit esc and then copy the whole function() above on this page and paste it by typing p in your terminal. Type i to amend changes in the terminal and change the name in the function() validate to match yours if you want. Type esc and then type wq and hit Enter. Open StarUML and go to Help > Enter License. Enter the name and the License Key in the LicenseManagerDomain.js. hello, how generate c++ code from class diagram? Copy the file to the Desktop, modify it, paste it back in the folder OR use Visual Studio Code, when saving it will warn you that it can't save without administrative rights, click on it and it should be good to go! thank you very much. your code is worked! very good concat ! ! thanks! Works smoothly on MacOS X High Sierra! Thank you so much! Don't forget to buy a licence when you can. bloody hell, it is working perfectly!. Thank you. Working !!! :v thank you . it's working!!! thank you so much!!! Well! PS: I guess you need to disconnect your internet connection first! Because in the version v3.0, this method do not work, I will share the license of the previous version 2.0 just in case anyone need to license the app but do not know how to modify the file above. When I download the StarUML i get just the .exe file and not the whole directory so i can't find LicenseManagerDomain.js what should i do ?? any suggestion please !! It doesn't work for me ! please could you show us your steps ? On Linux you can execute the AppImage with the flag --appimage-extract. Apparently I had to repackage the extracted appimage to run the modified StarUML source. How do you repackage @cakecakecake? According to the docs, I need to have .AppDir in place, which I don't have. I'm running Ubuntu and there is this only folder called squashfs-root. I modified my app.asar in the resources directory. @kharek, every time I try to extract the apimage from staruml, it only extracts the folder squashfs-root, without any other program data. Am I missing a step? @victorpenna did you chmod +x the file (chmod +x StarUML-3.0.1-x86_64.AppImage)? are you extracting in on linux on a ext3/4 partition? Fat partitions some times are a bit of a hassle for Linux applications. I tested that on a ubuntu 18.04, it might vary slightly on other distributions. It doesn't work with the 3.0 version. After you install this version, just apply what the original post tells you to do. @kharek Many thanks! Your solution worked. But there are minor tweaks for the latest version (StarUML-3.0.2-x86_64.AppImage). If you're using npm for the first time, then you can't directly call asar from the terminal. You need to update your $PATH variable to include the .npm-global directory to directly call globally installed npm packages. This can be done by adding export PATH="/home/$USER/.npm-global/bin:$PATH" (may differ based on your config; refer to this SO answer) at the end of your .bashrc. Then logout and login again. Working on starUML version 2.8, windows 10. Congrats!! Do you have any idea on how to do this on Windows? This is how to force StarUML 3 for not validate the license in MacOS. Open new Finder window and go to Application. Find your StarUML app, opt+click to show context menu and choose Show Package Contents. Open your preferable terminal app. Install asar package if you haven't done it before by npm i -g asar. I assume you have installed NPM before and if not, please google how to install it. Copy the new app.asar back into your StarUML contents. See step 3 & 4 if you forgot where to place the asar back. Open StarUML and done. Your StarUML has a valid license now. @arviantodwi thank you! It's work! Your solution worked for me in windows, just extracted the app.asar, changed the source code and repacked the file, then I replaced the old app.asar with the new one, all works fine, thanks! 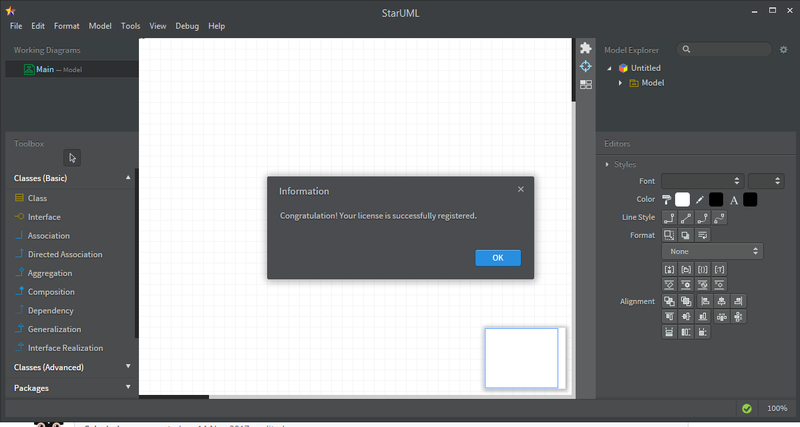 i have followed the instructions, but when i run StarUML.app appear "App is damage". Maybe someone can help me ? Cause i need to create DFD in version 3. How do you use Windows 7? I have tried opening the app. Basically on Notpad ++ run administrator when editing the validity file then I save it directly when running it can't? then is the app.asar file copied and then saved to the desktop in what format ?? after that, just copy it to the app file. If you eat it, you will double paste and then appear copy and replace ? It works under Windows 7 to run StarUML. The license-manager.js file in app/src/engine has been edited with Notepad ++ according anhtuanqn1002 comment. It Work perfectly, thanks a lot. I think they took precautions regarding this trick.